Considered to be one of the best movies of 2016, La La Land has surged in popularity since its release in US theaters one month ago. The film made history Sunday night at the 74th Golden Globe Awards when it won seven nominations: a feat no other movie has accomplished. La La Land has already proven to be a tremendous success. As an avid movie-musical fan, I was very excited to see the film. Set in modern Los Angeles, the film tells the story of Mia (Stone), a barista and aspiring actress, who dreams to gain Hollywood fame. Mia repeatedly encounters Sebastian (Gosling), a jazz pianist, who aspires to open his own jazz club. Though initially hostile towards one another, this tension quickly diffuses and spurs a romantic relationship. Mia and Sebastian encourage each other to follow their dreams despite repeated challenges and frustrations, including failed auditions and lost jobs. As Sebastian pursues a path to fame and stardom, Mia questions their future. Ultimately, the couple is forced to choose between pursuing a romantic relationship or their life-long dreams. The film encourages that success can be achieved from repeated failures, which is both realistic and persuasive at its conclusion. Stone and Gosling once again make an impeccable on-screen duo, with their strong chemistry previously established in Crazy, Stupid Love. I was initially hesitant about their roles as lead characters of a musical, having only seen them act in dramas and romantic comedies. However, my skepticism quickly dissipated. Not only are they wonderful actors, but also, fantastic dancers and musicians. 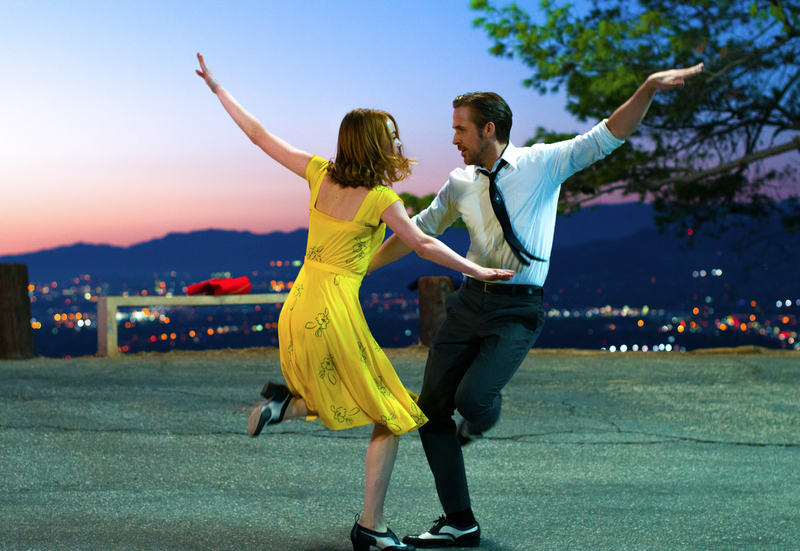 Stone and Gosling gracefully tap-danced, waltzed, and jived throughout a number of high-energy musical performances. Stone’s high vocal range and Gosling’s intense piano solos were equally impressive. Two of my favorite songs, “A Lovely Night” and “City of Stars,” were performed by Stone and Gosling as duets. It was a pleasure to watch these accomplished actors share their musical talents. While the musical components may deter some audiences, the movie skillfully delivers aspects of romance, comedy, and drama, as well as a number of unexpected plot-twists. Not only was I continually impressed by the musical components, but also by the movie’s unique cinematography. Throughout the film, the lighting contrast mimicked a stage monologue to reflect a solo performance. Refreshingly, they also incorporated a variety of scenes that transcend the stage, such as dancing on cars parked in traffic on a Los Angeles freeway. This scene introduced Jimmy Fallon’s La La Land parody at the Golden Globe Awards, and will likely be recognized for years to come. The modern musical takes risks, and is successfully rewarded. I wholeheartedly agree with the overwhelmingly positive response: La La Land is one of the most unique and enjoyable films of 2016, both for musical and non-musical viewers alike. The movie is enchanting and memorable, and truly worthy of its recent accomplishments.